In the UK, millions of people are at risk of developing heart and circulatory diseases, associated conditions, or living with their devastating consequences. Our Healthcare Innovation team exists to support them. They provide much needed information and advice, create resources and design frontline services. They are a completely unique team whose work spans patient support through to content creation, influencing clinical services at the highest level and delivering our CPR programme. With so much activity, we are able to offer a huge breadth of roles within Healthcare Innovation. We have roles that call on specialist medical knowledge, while others make use of a host of transferable skills. Innovation is front and centre, and we are always looking for bold, new ideas that have the potential to transform lives. If you have a motivated ‘can do’ approach, you’ll benefit from a being part of an incredibly professionally diverse team, you’ll be given the chance to learn new skills, and encouraged to bring new ideas to the table. I joined as the Editor of Heart Matters magazine. The opportunity to work for a respected charity and make a difference to people’s lives doing what I love – writing – was too good an opportunity to pass up. What I love more than anything is telling stories and I have done ever since my Mum refurbished her second hand typewriter for me when I was about nine years old. My team tells inspirational stories of people living with cardiovascular disease, which we use to inspire others affected by it. We know that by equipping patients with information that they’re better able to manage their condition and so it’s great I’m playing a small part in their stories, too. The people. My colleagues are amazing and I’ve been privileged to meet some of the world-class researchers whose work we fund. Every time I do it blows my mind. I’d followed a clinical nursing path – in the NHS and private practice - for several years. I had no idea opportunities existed for nurses like me in the charity sector. But the reputation of the BHF spoke for itself on my ward - we would always use the resources to help educate our patients. So when I saw the vacancy here I was keen to apply. 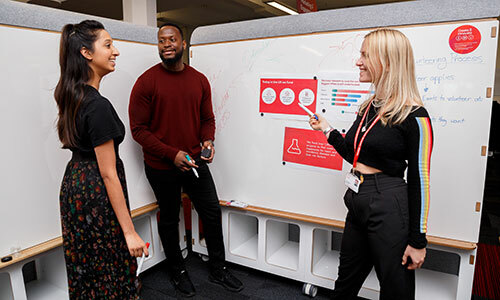 My role is to ensure that everything that comes out of the charity, whether it’s printed resources, fundraising materials or a TV advert, is medically accurate and maintains the reputation of the BHF as an expert source of information. What are the best things about the BHF? The thing I appreciate the most here is having a voice. Often in my previous roles this hasn’t been the case, and it can be enormously frustrating. The first time someone genuinely asked for my opinion here I almost fell down.